What would your life be like if you managed your time so well you had the time to do what you really WANT to do, not just what you HAVE to do? What would it be like to rest well at night, without worrying about how you're going to get everything done the next day? What would it be like to be free to enjoy your time off because your other tasks have already been taken care of well in advance? What would it be like to have more time than just weekends to do something you want to do? What would it be like to actually have some time each day to do what you really want to do? What would it be like to have all the information you need to accomplish this for less than the price of an average value meal at a fast food restaurant? What would it be like to live in freedom, unafraid that things are slipping through the cracks? JUGGLE is an e-book that will help you experience wild success when it comes to juggling your roles and responsibilities. 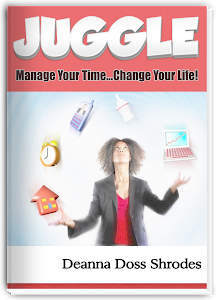 JUGGLE is written by a certified coach with a 25 year stellar record in time management and productivity. You’ll learn wisdom keys to manage your time that won’t take you a week- long conference or several days of seminars to digest. You can manage your time and change your life! Don’t have a Kindle? No problem. You can read the book on any computer or mobile device. Find out more, here. "This book is not like ANY other time management book or blog post you've encountered before..."
“As owner of two home businesses, I had a couple of “DUH!” moments while reading this book and began following the principles immediately. I already feel a weight lifted from my shoulders! "I absolutely LOVE, LOVE this book! It's just the right length for a busy professional...this book couldn't have hit my inbox at a better time..."
"An amazing book I highly recommend and will keep going back to time and again!" "It's a 'make my day' kind of book. You won't want to put it down until you have read it cover to cover." “In Deanna's chapter on "Setting Boundaries" there are FIVE SIMPLE WORDS that can change your life and set you FREE!! "...it's like having Deanna over for coffee and some face-to-face life coaching. Priceless resource!" "I love this book! Without a doubt, this is the most user-friendly, realistic, and encouraging book on time management that I have ever read. Quite frankly, this has become my go-to resource for quickly realigning my own efforts and priorities." "This book gave me a lot of tools to help me stop dreaming about what I want to accomplish and actually DO it! I can’t wait to start implementing this advice to manage my time better!" "...grab this book if you're feeling overwhelmed and don't know how to get it all done, much less where to start. I'll tell you where to start - start by reading this book!" "...a book on time management that is easily readable in about an hour; the principles when applied could just as easily give one a 1000 fold return on that hour. Imagine what you would do with a thousand more hours in the next few months." "... helps men and women alike, and should be required reading for teens." "Insightful and encouraging, with a hands on approach..."
"JUGGLE is a must read!" “Too many books on time management tend to, well, take up way too much of your time with academic theories, flow charts and complicated processes to follow. Doss-Shrodes introduces ten basic principles, designed to free you, not overwhelm you. I instantly felt motivated…and less stressed!" "Her transparency will make you laugh or cry with every turn of the page..."
"Deanna Shrodes writes with passion and a pointed perspective that has pushed me to go from being content with my time to being excellent." "Deanna shares her personal experiences that seem to give you a green light for making decisions you've only thought of but were afraid to..."
"This book is time management at its finest. The "Master Initiative List," is a God send; I intend to use it immediately!" I love when a book not only inspires you to want to make the changes it suggests, but also gives you the confidence to believe you can do so successfully with a few very practical steps!" "This e-book will be a worthwhile investment in yourself and your future!" "If you have ever longed to be more productive or wondered how to make a more organized life a reality, then JUGGLE is a must read!" "A definite must-read if you are looking for a resource that will transform your life!" "So practical and so right on. JUGGLE is a great read that will definitely change your life when you decide to apply the principles to your daily routine." Copyright 2012 Deanna Doss Shrodes. Simple theme. Theme images by Jason Morrow. Powered by Blogger.